Director - Navayuga Real Ventures Pvt. 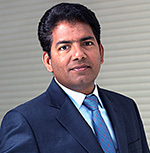 Ltd.
Mr. Arvind started Navayuga Real Ventures Pvt. Ltd. with his rich experience of over 15 years in the Real Estate industry. He has spent the last decade excelling in the development of land and commercial spaces, and construction of educational institutions. Since its inception, Navayuga Real has already completed few projects and few more are in progress under the able leadership of Mr. Arvind. While he is highly task-oriented and is known for delivering quality structures before time, he isn’t all work and no play. He has represented Hyderabad and South India at the Ranji Trophy under 19, under 21, under 23, and under 25. In addition to being the Director at Navayuga Real Ventures Pvt. 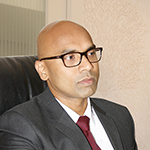 Ltd., Mr. C. Sasidhar is also the Managing Director at Krishnapatnam Port Company Ltd., a Director at Navayuga Engineering Company Ltd., and Krishnapatnam Port Container Terminal Pvt. Ltd.
As the chief architect of the new-generation Krishnapatnam Port, which is fast emerging as the biggest in the country, he has his undivided attention on making the Port region an industrial hub. His strong organisational abilities have helped achieve the fastest project execution and commissioning of Krishnapatnam Port in a record time of 18 months. Mr. Sasidhar spearheaded the development of the Group’s overseas business, especially in the areas of object-oriented IT development, Internet/Intranet technologies, QA/Test series with companies based in Europe. He is also the founder of CVR Foundation, the CSR arm of the CVR Group of companies. Within a short span of time, he has developed the Foundation into an icon of indomitable commitment to the betterment of the local communities and hence, the society at large. Being the guiding force of the Foundation, he is always at the forefront, driving the team towards CVR’s mission. Mr. Sasidhar received Maritime Gateway’s Maritime Businessman of the Year Award – 2015. He is also a member of the Confederation of Indian Industry’s (CII) National Committee on Ports & Shipping for the year 2015-16. Due to customer friendliness and willingness to accommodate our requirements we have a great working experience with Navayuga Group. Our experience with Navayuga group in terms of their capabilities has been positive, we look forward to further expending our business association with them.